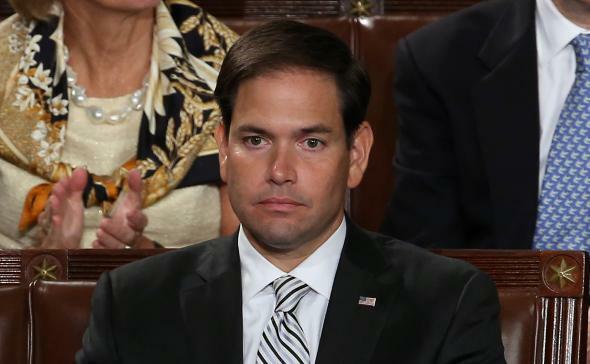 Marco Rubio "hates" Senate, misses votes and committee meetings, is not running for re-election. Marco Rubio listens to Pope Francis in the U.S. Capitol on Sept. 24, 2015. The Washington Post evaluated Republican presidential candidate Marco Rubio’s Senate career in a piece published Sunday night, and the takeaway is not particularly flattering for Rubio or the current state of the United States’ system of government. Rubio had arrived at one of the least ambitious moments in Senate history and saw many of his ideas fizzle. Democrats killed his debt-cutting plans. Republicans killed his immigration reform. The two parties actually came together to kill his AGREE Act, a small-bore, hands-across-the-aisle bill that Rubio had designed just to get a win on something. “He wouldn’t be doing what he’s doing now if he were a quitter,” said Norman Braman, a Florida auto dealer and one of Rubio’s longtime donors. That’s, at best, a tricky argument to make. On the other hand, as the Post points out, Rubio did arrive in Congress at one of its least-active and most-polarized moments ever, and his high-profile work on the behalf of a compromise bill on an important issue (immigration reform) died because of his own party’s intransigence. Rubio’s apathy might not be inspiring, but if there is a way to deal constructively with our current state of affairs, no one else in Congress has found it either.